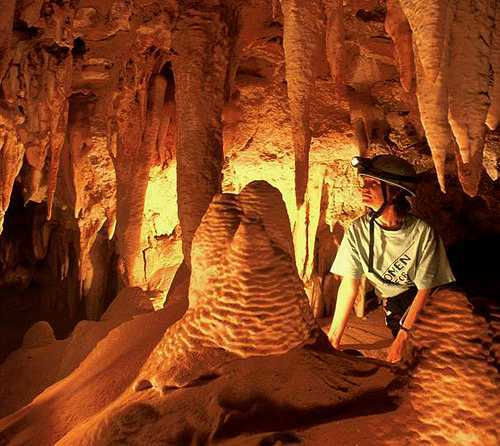 Two studies carried out by some of the world’s greatest experts in speleology (the scientific study of caves) indicate that cave tourism could be highly successful in Saudi Arabia. The cave has an adequate, but unimaginative lighting system. There are stairs, shown here, in one of the few areas which are not flat. The cave is also kept clean by a team of maintenance men. Amazingly, there is no entrance fee! Susy Pint squeezing through one of the narrow spots in a side passage. The entrance to Al Qarah Caves is in an impressive limestone hill (jebal) seventy meters high. Al Qarah has no formations like stalactites or stalagmites, yet attracts crowds of visitors every weekend. Surely the main reason why people love this cave must be its cool temperature which offers blessed relief from the sizzling heat and stifling humidity of the summer months on the East Coast of the Desert Kingdom. It is difficult to think of any other tourist attraction that can offer people in the desert a chance to get a bit of exercise in a cool, natural environment. 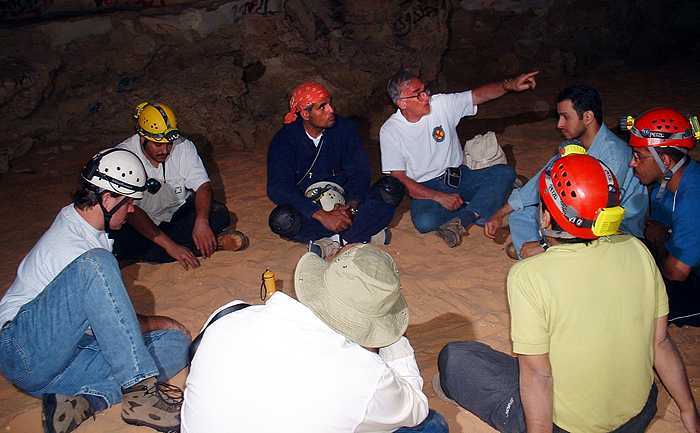 In March, 2003, Professor Paolo Forti, former president of the International Union of Speleology, was brought to Saudi Arabia under a joint project of the Italian Speleological Society and the Saudi Geological Survey, to investigate several caves with tourism potential and to write a report on the subject for interested Saudi investors. I was a member of the team that welcomed Prof. Forti and guided him to several of our favorite Desert Caves. We decided to take him first to a place known as Friendly Cave even though its vertical entrance would strike most people as anything but “friendly.” To get inside you have to rappel down a rope or climb down a hanging ladder for eleven and a half meters. For purposes of tourism, however, a spiral staircase could easily be inserted into the entrance shaft. Once you are inside, the friendliness of the cave becomes apparent: the soft, sandy floor is almost flat and is also aesthetically appealing. The ceiling is about two meters high. After a short walk from the entrance, you come to several rooms filled with dramatically beautiful stalactites and stalagmites. 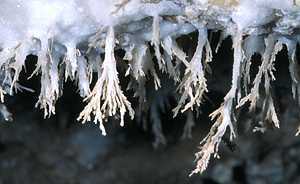 Upon closer inspection, you can find curious helictites and countless tiny gypsum formations. The nicest decorations of this cave are conveniently grouped near the walls, so it would be possible to allow visitors to get quite close to them, but not close enough so they could touch them. Finally, the cave is separated from a major road by only two kilometers of flat hard pan, easily drivable even by passenger cars. This photo by Lars Bjurström demonstrates how creative lighting can bring out the beauty in Friendly Cave. Many Saudi caves are richly decorated with very small formations that visitors only notice when they look carefully. We asked Paolo what needs to be done to turn a wild cave into a Show Cave. He explained that a very detailed survey of the cave (much more accurate than the surveys we normally do) should be carried out, with special attention to the stability or non-stability of the cave’s features. This is to make sure nothing is going to fall on the heads of the cave’s visitors! Next, one must set up sensors both inside and outside the cave to measure temperature, humidity, etc. With this information, the cave’s owners or managers can avoid drastically altering the natural environment of the cave and possibly “killing” it. 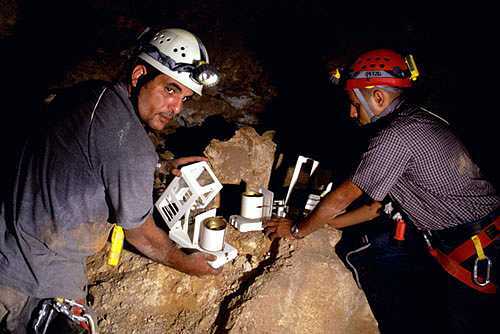 Saudi geologists installing sensors in Surprise Cave. The lighting in a tourist cave is another thing that has to be considered carefully. The typical light bulbs used in homes and industry encourage the growth of ugly lampenflora: bacteria or fungi which transform beautiful formations into hideous black or green monstrosities. Since there are obviously a number of expenses involved in developing a Show Cave, one of the first questions that we asked Paolo was whether the cave owner could actually expect to make a profit from this kind of business. A glance upward may reveal unexpected beauty overhead. The next cave we visited with Paolo Forti was Surprise Cave, which was discovered by Lars Bjurström and called “Surprise” because the narrow, dusty entrance shaft gave no hint that deep inside lay the best-decorated cave so far found in Saudi Arabia. Some 652 meters of passages have been surveyed in Surprise Cave, but many others have not been mapped and beyond them lie still more passages that have not been visited at all. Two entrances to this cave have been found so far, but it is likely that others will be found in the future. One of many richly decorated displays in Surprise Cave. 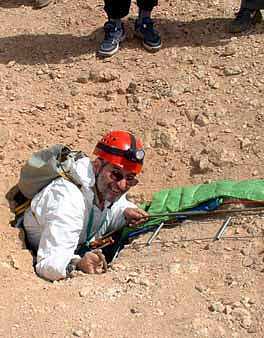 Left: Professor Paolo Forti in the 15-meter-deep shaft entrance to Surprise Cave. 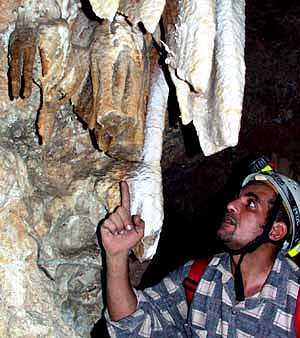 Right: Mahmoud Al-Shanti indicating where stalactites were broken off in 2003 in this cave. Gates and fences need to be installed in order to protect the most beautiful Saudi caves from further vandalism. Although not as richly decorated as Surprise Cave, Murubbeh (also known as B7 Cave) was chosen by Paolo Forti as the best cave on the Summan Plateau for immediate development into a tourist cave. This is because, at 15° C, Murubbeh is much cooler than any other cave in the area. 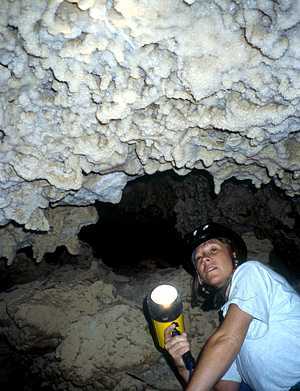 “The idea of visiting a Cool Cave in the Hot Desert will appeal to many people,” predicted Paolo. Since the cave is a short, two-hour drive from the capital city of Riyadh, it means there are five million potential customers nearby and definitely no competition offering anything similar. Murubbeh Cave has a wide walk-in entrance which leads to a large room where tables and chairs can be set up for people to relax and enjoy refreshments and perhaps visit small displays showing other caves in Saudi Arabia and the role they have played in providing water and shelter to desert travelers. The entrance to Murubbeh Cave, a favorite place for local people to escape from the sun or wind. 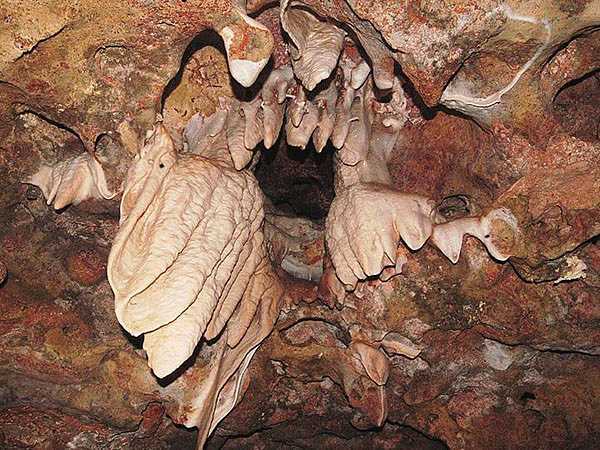 From a Visitors’ Center in the large room, tours could be conducted to other passages of the cave which are decorated with large and small calcite crystals formed long ago when the cave was entirely submerged. A clever lighting system could easily create a “sparkling wall effect” which may be unique among the world’s Show Caves. Murubbeh Cave also has a section were hundreds of bones have been found as well as animals “naturally mummified” thanks to the cave’s cool temperatures and low humidity. Left: plates the size of potato chips are glued to the cave wall. 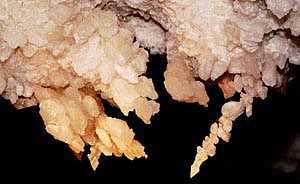 These are the broken remains of the thin calcite layer which once floated on top of a huge lake inside this cave. Millions of tiny crystals sparkle whenever light is shone on them. Right: The cloud-like white ceiling in this passage also sparkles. Slowly moving artificial lights could make this into a very attractive Show Cave. 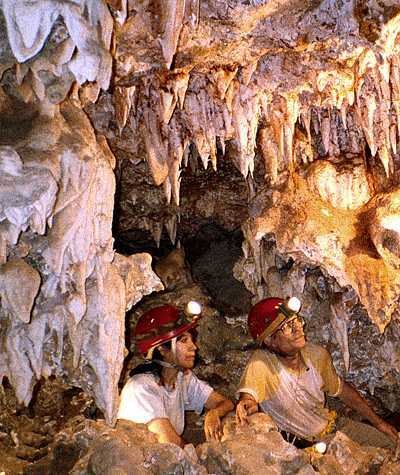 Experts estimate that up to 1,000 persons could be taken on tours of Murubbeh Cave during the course of one day. The more adventurous might take a bus from the Visitor’s Center to Surprise Cave or one of several other “wild caves” for an ecotour requiring the use of helmets and headlamps. 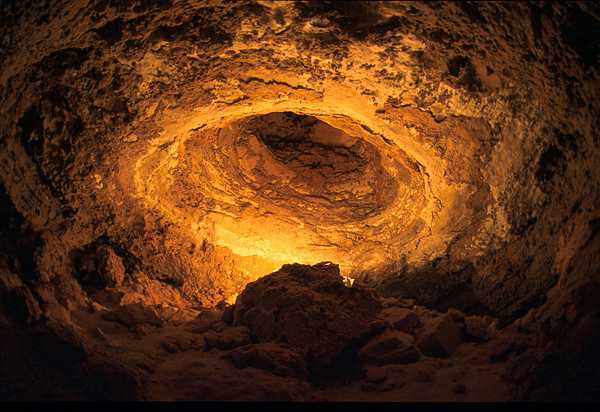 This impressive natural dome is one of the many interesting features of Murubbeh Cave. 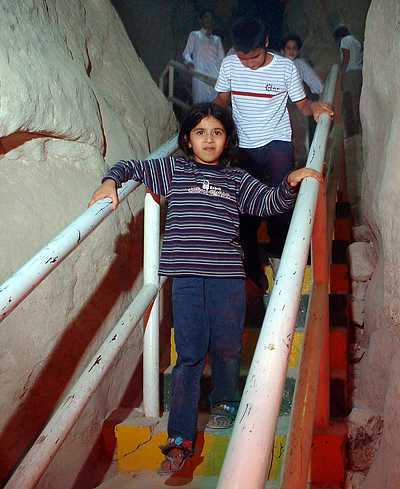 In 2004, Dr. Arrigo Cigna, one of the world’s leading experts on Show Caves, visited Murubbeh, Surprise and other caves located north of Riyadh. 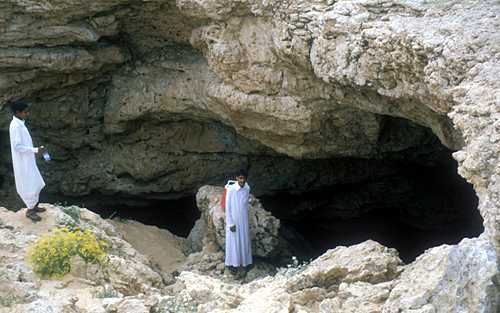 In discussions held with representatives of the Saudi Geological Survey and the Supreme Council on Tourism, he confirmed Professor Forti’s observations on the suitability of several desert caves for purposes of tourism and offered to act as a consultant to interested investors as well as to the team that might undertake the transformation of wild caves into Show Caves. 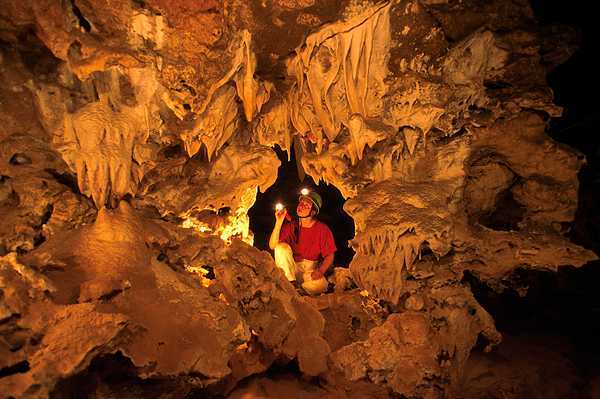 According to newspapers, Oman will open its first Tourist Cave (Al Hota Cave) in July, 2007. Hopefully, Saudi Arabia will likewise allow its public to discover the beauty that lies beneath its vast deserts and to enjoy some of the least known sites of Arabia’s natural heritage. 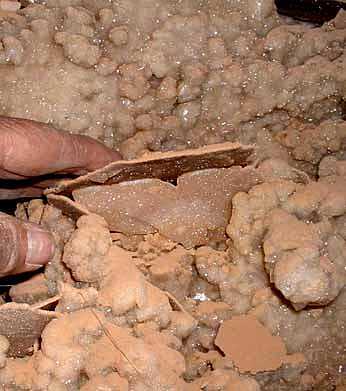 For more information, readers are invited to download a report entitled The Development of Tourist Caves in the Kingdom of Saudi Arabia from this web site or to purchase it from Saudi Geological Survey .